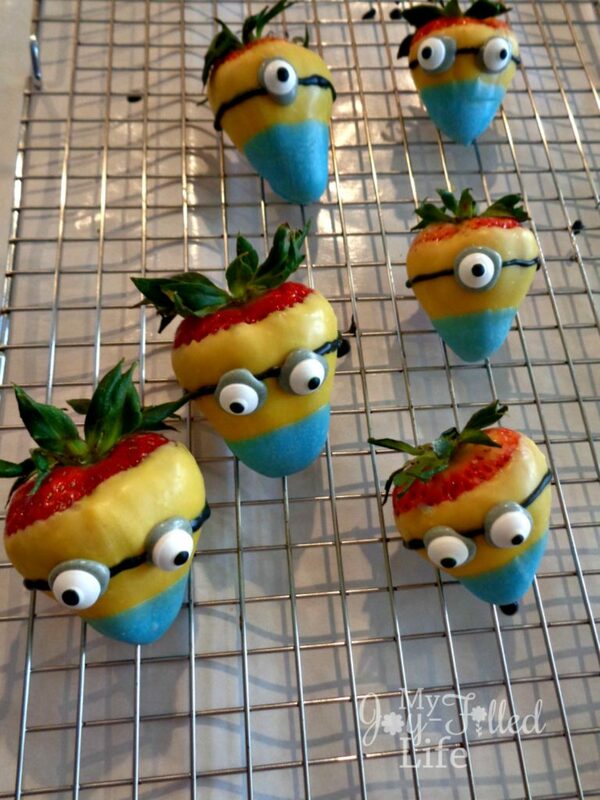 My kids are looking forward to the newest Minions movie that is coming to theaters this week. Since we are a family of 10, we don’t go to the movies that often because it’s so stinkin’ expensive. 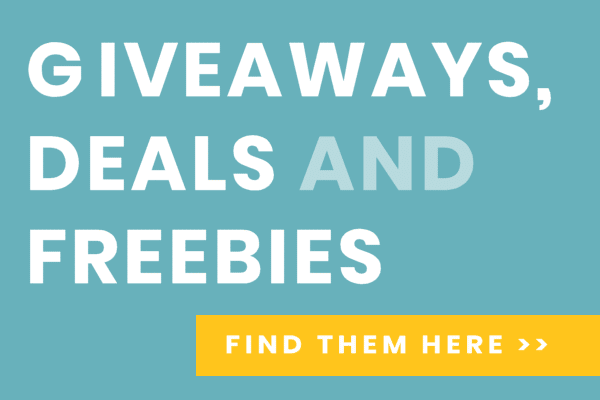 However, we do like to treat the kids from time to time, so we will only go on a Tuesday when it’s $5 movie day at Cinemark and we let the kids know in advance that we won’t be getting any popcorn or drinks (that usually ends up costing more than the movie). So if we are going to spend 50 bucks at the theater, it better be a good movie. 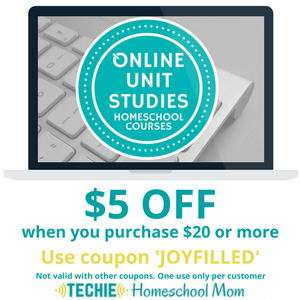 Despicable Me is one of our family’s favorites (even my husband and I still enjoy watching it) and those Minions are so darn cute and funny, so we will most likely splurge and see this one in the theater. 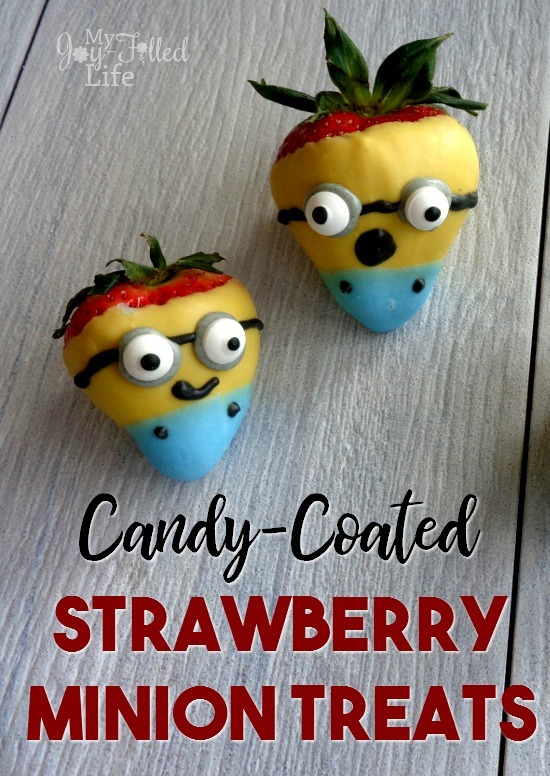 I thought it would be fun to surprise the kids at lunch time with these candy-coated strawberry Minions and then let them know we are headed to the movies once lunch is over. 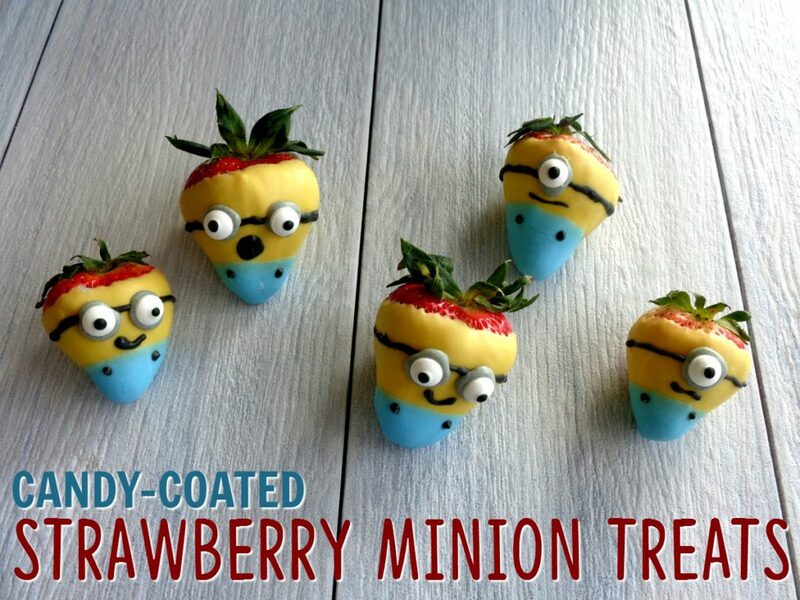 My kids love strawberries too, so I’m thinking this treat will be a hit. 1. Wash your strawberries, set them on a paper towel and allow them to dry completely. 2. 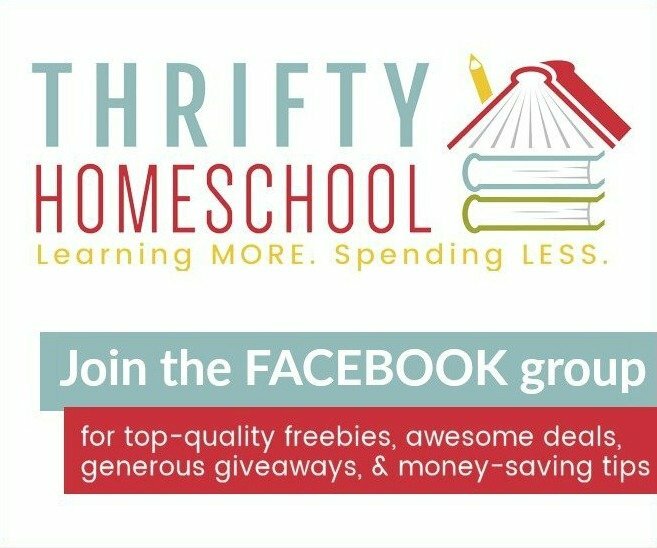 Pour the yellow candy melts into a small measuring cup or bowl. Follow the package directions for melting. 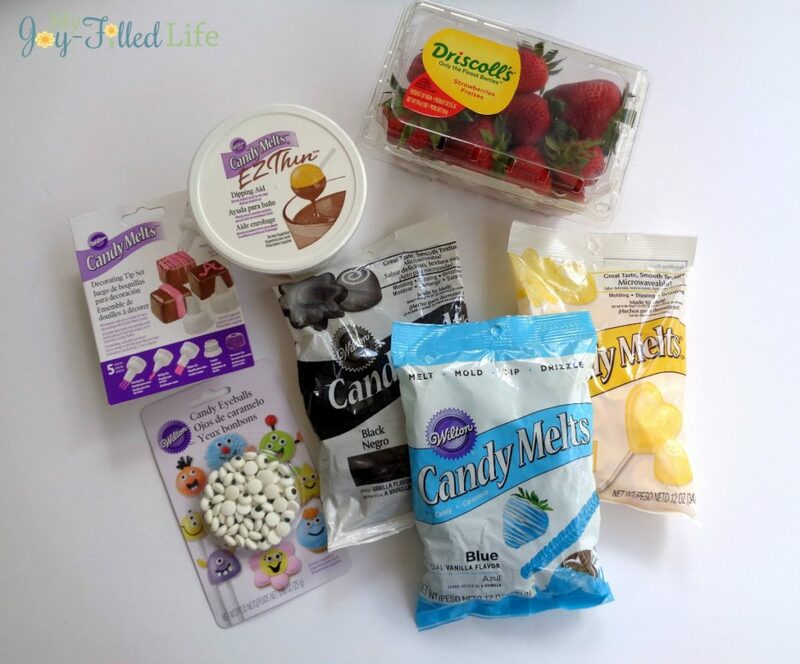 Use E-Z Thin to thin out the candy melts or a bit of Crisco. Add a small amount at a time. 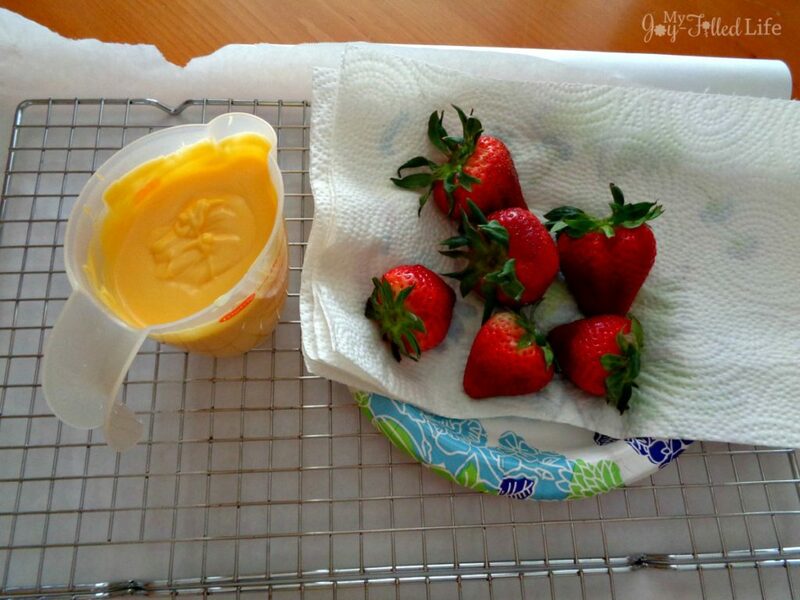 You want your candy melts to be a consistency that you can dip your strawberries into. 3. 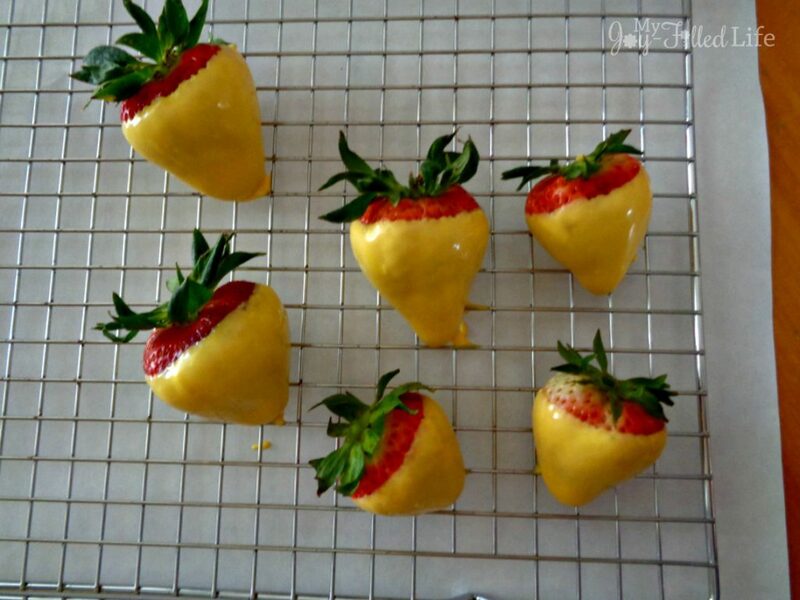 Dip the majority of the strawberry into the yellow candy melts. Pull the strawberry out of the candy melts and allow some of the excess to drip off. Place the strawberry on a wire cooling rack. After the excess has dripped off, move to a sheet of wax paper to dry. 4. 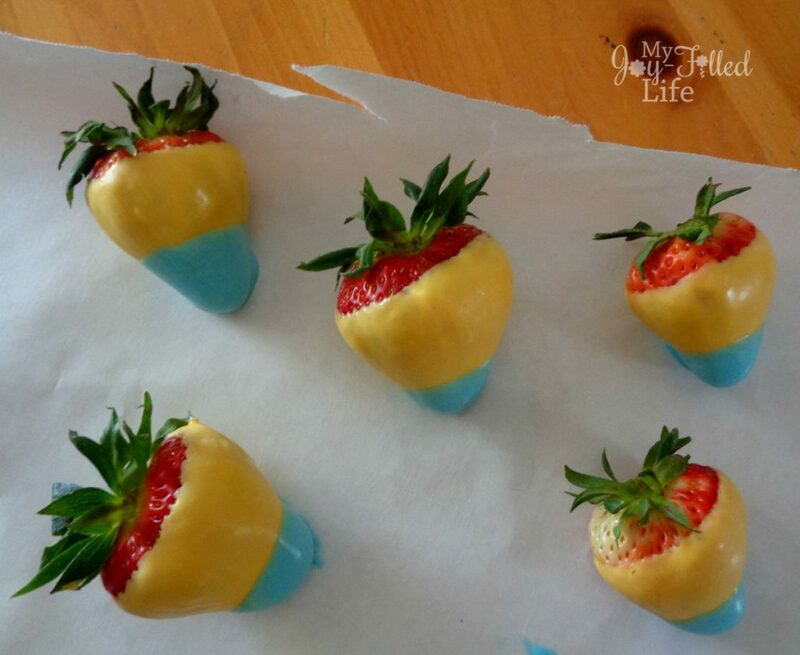 While your strawberries dry, repeat step 2 with the blue candy melts. 5. 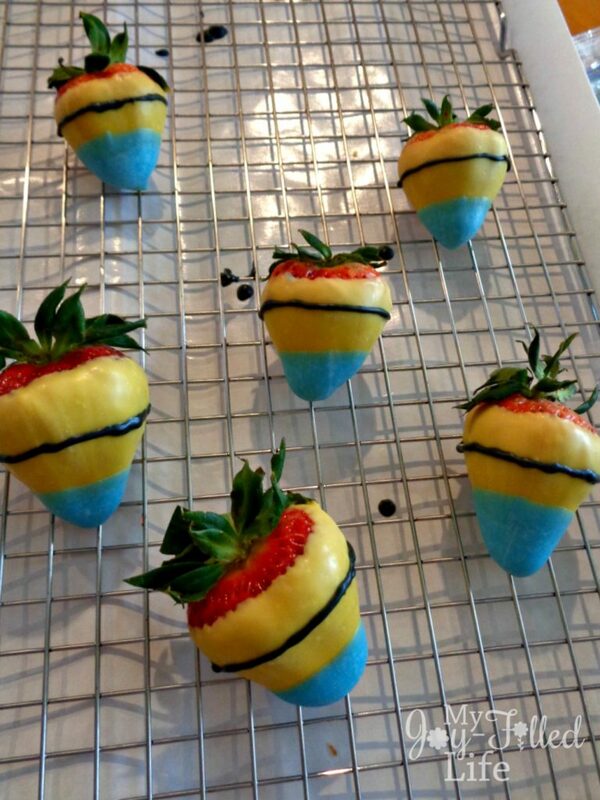 Dip the tip of your strawberry into the blue candy melts. Pull the strawberry out of the candy melts and allow some of the excess to drip off. Place the strawberry on a wire cooling rack. After the excess has dripped off, move to a sheet of wax paper to dry. 6. Repeat step 2 with the black candy melts. 7. Pour the black candy melts into a decorating bag or Ziploc bag with the smallest candy melts decorating tip attached. 8. Pipe black lines onto your Minion. 9. If you would like to add gray to the goggles, you’ll need to add white candy melts to another batch of black candy melts and prepare a second decorating bag. 10. Pipe circles of black (or gray if you make a batch) onto the black lines. While the candy melts are still wet, add the candy eyes. 11. Pipe on some fun faces with the black candy melts and add buttons onto their overalls. You could also add some hair! 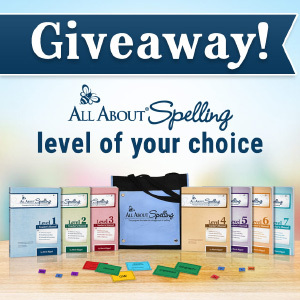 Have fun with these and let your little ones help.